I read somewhere that family get-togethers are all about making memories. Seems like get-togethers should be about enjoying family, with memories just a bonus. But I guess that’s the way we are … always racing around, trying to get to the future so we can look back on the past with fond memories. And I get it, I do. For some of us, looking back on false—I mean, fond—memories is the only way we can enjoy the holidays. Until now … because I’ve put together a list of ten things that will ensure your celebration is both enjoyable and unforgettable … exactly the way it actually happens. 2. Carry a large purse, preferably one with a zipper. Trust me on this. 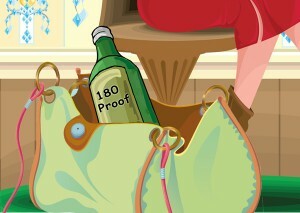 You don’t want relatives seeing your bottle of liquor. Not because they’ll be shocked, but because someone will steal it. 4. Don’t let anyone keep you from taking your turn at karaoke, especially if you’ve downed all your liquor. Giggle uncontrollably throughout everyone else’s turn. 6. Gossip. A lot. The best targets are family members who aren’t there to defend themselves. 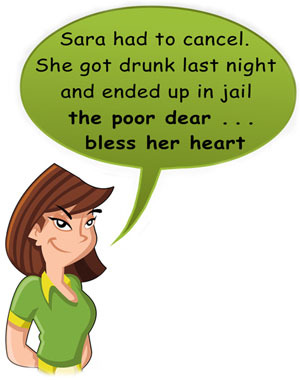 Be sure to end each remark with “the poor dear … bless her heart.” This will allow you to toss out salacious tidbits that everyone can enjoy, while at the same time making you sound compassionate and sympathetic. It’s a win-win situation. 7. Invite as many children and teenagers as possible. Make all the adolescents except one—the one most likely to lord it over the others—sit with the young children. 8. Tell the kids to come to the party au naturelle. I’m not talking naked, I’m talking off their medication. Family dinners are more fun if adults are off their medication too, unless they’re on something that will improve the family experience, such as pain pills or valium. In that case, they should take double. 9. Speaking of kids, if you have any, criticize everyone else’s and brag about yours. Every time you open your mouth. 10. Be sure to wash your hands when you use the restroom (a sanitary guest is a welcome guest). Before you dry your hands, dribble some water on the toilet seat. And because you’ve been patient and read all the way through this post, here’s a tip I wasn’t planning to give, but which I think you probably deserve: Don’t follow any of the tips above (well, except for the one about the large purse and bottle of liquor. Trust me … you’ll want to follow that tip.) Instead, plan to attend without any expectations, be yourself, and allow others to do the same because each person brings something special to the table. And what a boring table it would be otherwise. If you’re looking for more to read, check out these blogs . . .
Wade Rouse actually makes his sweet potato casserole with marshmallows on top, and don’t eventhink about removing them. Check out his Chick Lit Central blog entry, The Go-To-Gay: Kid-ding around on Thanksgiving. Persephone Magazine’s A Beginner’s Guide to Surviving Dysfunctional Family Holidays gives advice in the form of the good, the bad, and the ugly. I had to list it because the writer refers to the holiday get-together in question as The Smith Family Apocalypse. It’s a sign! 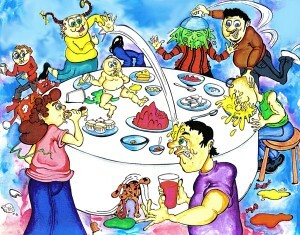 On the Oprah.com website, Martha Beck gives 5 Ways to Survive Your Next Family Gathering. It’s another sign. My mother read “Brer Rabbir and the Tar Baby” to me—a lot. I didn’t care for the story but my mother sure did enjoy reading it.